Co-founder Daniel Ek says competition from Apple and Amazon is having no “meaningful impact” on Spotify. Spotify shares dropped 9% after its first earnings report as a public company disappointed investors. The Swedish firm said losses narrowed to 41m euros (£36.1m; $49m) in the three months to the end of March from 139m euros a year earlier. But while the results were largely in line with estimates, investors remain concerned Spotify is losing money. “Investors were hoping for a little more”, Atlantic Equities analyst James Cordwell told Reuters. He pointed to slow growth in North America – which is seen as a gauge on how it is competing against Apple and Amazon. 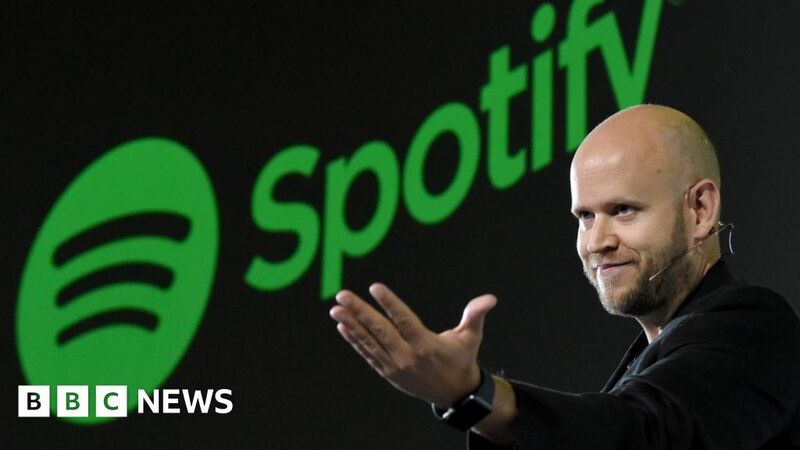 But Spotify chief executive and co-founder Daniel Ek said that he did not see any “meaningful impact” from competition. “When we look at this, we don’t really think that this is a winner-take-all market. In fact, we think multiple services will exist in the market and we are all in a growing market,” he said. Spotify’s sales hit 1.14bn euros (£1bn; $1.37bn) in the three months to the end of March. And while the music streaming pioneer’s total user base reached 170 million, less than half were paid subscribers. Morningstar analyst Ali Mogharabi suggested that part of the problem may be that it was offering “too many discounts” on music subscriptions and extending the length of free-trials as it tries to convince users to start paying, rather than the free, advertising-funded service. Spotify was valued at about $26bn in its market debut in New York last month. Since its listing, it has been reported that Sony – a key investor – had cashed in nearly half of its shares.